The following is the address by Des Dalton, President of Republican Sinn Féin, at the party’s 108th Ard-Fheis in Dublin on November 11. You are most heartily welcome to our annual Ard-Fheis. Since last we gathered in national conference we have seen the twin imperialisms of British occupation, on the one hand, and the EU/ECB and IMF, on the other, tighten their grip on Ireland. Increased repression in the Six Counties coupled with the surrender of any remaining vestiges of economic sovereignty to the EU by the 26-County State shows the challenge that lies ahead for the progressive forces for political, social and economic democracy. Those words are no less relevant to the Ireland of 2012 than they were to that of 1914. Today the forces of reaction that are arrayed against us are no less formidable, but just as Connolly, Pearse and their comrades identified the opportunity that such a challenge held for their generation, it is up to the present one to likewise find the opportunities that are presented to us and exploit them to the full. The year began with a very successful commemoration of the 40th Anniversary of Bloody Sunday in Derry. On Sunday January 29, people from Derry and throughout Ireland defied the political establishments of Stormont, Westminster and Leinster House when they came out on to the streets of Derry to remember the 14 unarmed civil rights marchers murdered in that city by the British Army’s Parachute Regiment on January 30 1972. Three thousand people according to the Irish Times of January 30 made their presence felt in a dignified display of solidarity with the survivors and families of the victims of Bloody Sunday. The march was to further the cause of truth and justice. But the presence of such a large crowd also told us that the pulse of Irish nationality still beats strong despite the censorship and repression of Britain and its surrogates. As Republican Sinn Féin pointed out at the time of its launch, the Saville Inquiry failed the crucial test of holding the British Government to account for the events of Bloody Sunday. Instead as pointed out by Éamonn McCann on BBC’s Spotlight programme the Inquiry was limited to dealing with the British soldiers who were present on the ground but not allowed to investigate the military and political chain of command which placed the British army’s notorious Parachute Regiment in direct confrontation with unarmed civil rights protesters. In August of 1971 the same regiment was responsible for the murder of 11 people in the Ballymurphy area of Belfast. The failure of the British State to bring any prosecutions against the British soldiers identified in the report as being responsible for the murders is in stark contrast to the ongoing arrests and charges being brought against people by the HET (Historical Enquiries Team) in relation to events over the past 43 years. Kate Nash, whose father William was murdered on Bloody Sunday spoke eloquently and movingly of the pain endured by the families over the past 40 years. She also used the occasion to remind people that those murdered on Bloody Sunday were marching against internment while 40 years later internment was still a reality in the Six Counties citing the examples of Martin Corey and Marian Price. All of this must be seen in context. The Saville Inquiry was hailed by the so-called constitutional nationalist parties – including the Provisionals – as drawing a line under Bloody Sunday – despite its obvious shortcomings. Keeping up their side of the bargain as it were, they moved almost immediately to announce that the annual march, organised by the relatives would be wound up. Thus another uncomfortable truth about the nature of British rule would be conveniently brushed under the carpet. They went so far as to threaten those families who had stated their intention to continue with the annual Bloody Sunday march that they would “de-legitimise” any future march. Soon after this it was announced that Derry had been designated as ‘UK City of Culture’ for 2013. It is evident that the British State is now attempting to co-opt the three strands of a distinct Irish culture, our games, music and language in order to prop up British rule in Ireland. Over the past ten years, beginning with the ending of the ban on members of the British Crown Forces joining the association, the GAA at leadership level have allowed Cumann Lúthchleas Gael to be used in the campaign of normalisation of British rule. This was followed by the England Rugby team playing in Páirc an Chrócaigh in 2007 and culminated in the Queen of England’s visit there in May of last year. In December the historic ground was used to stage a Gaelic football match between the RUC/PSNI and the 26-County police. As a result of blatant political pressure Comhaltas Ceoltóirí Éireann effectively forced its Ulster Council to overturn its initial decision not to hold the annual Fleadh Cheoil na hÉireann in Derry as part of the promotion of the so-called ‘UK City of Culture’ year in 2013. As Patrick Murphy points out in his column in the Irish News of January 21: “The Fleadh is a particularly Irish event, reflecting a proud tradition of music and song which survived centuries of ridicule, scorn and suppression.” Now however it is to be used to sell the notion of Derry and the Six Counties as being an integral part of the British State. Of course Irish Republicans would welcome the Fleadh in Derry but not for this purpose. We will be joining in the protests against this hijacking of Doire Cholmcille over the coming months. It has also been mooted that the Oireachtas festival – celebrating the Irish language – will also be held in Derry next year. Patrick Murphy tellingly points out that while constitutional nationalism has now fully embraced British rule and as a result is drifting from cultural nationalism, which still extols a sense of Irish separateness from Britain. However Britain recognises this: “If you were in Whitehall today trying to bed down the latest British victory in Ireland, you would bring cultural nationalism into line with political nationalism. That explains the political pressure to bring the Fleadh to a British government event in Ireland,” Murphy states. In the last year in Newry, the RUC/PSNI held an Irish language public meeting, using the language as a recruiting tool. Former British Six-County Direct Ruler Peter Hain let ‘the cat out of the bag’ regarding the British government’s real attitude to the Irish language. The newspaper Gaelscéal reports Hain as admitting that the promise of an Irish Language Act for the Six Counties was off set by moving its ratification from Westminster to Stormont where, Hain proclaimed there would be an “inbuilt majority” against it. The ongoing internment of Martin Corey, Marian Price and others further underlines the fact that nothing has changed in the relationship between England and Ireland. The unchanging face of British rule in Ireland was underlined with two instances of the stark inhumanity of the regime. The first was the initial refusal and final granting of compassionate parole to Republican veteran and political internee Martin Corey to attend the funeral of his brother Peter who died on May 21. A request by Martin to the authorities at Maghaberry prison was refused, forcing Martin, only hours before his brother’s burial, to take his case before the High Court in Belfast on May 24. Martin was eventually allowed to attend the funeral, accompanied by two MLAs who collected him from, and returned him to, Maghaberry prison. This is not the first time POWs have been refused parole; in February another Republican POW, Damien McKenna was refused compassionate parole to attend his father’s funeral. The second instance was the overturning of a Belfast court ruling, which ordered the release of Martin Corey on July 9 thus exposing as myth any notion that the Six-County state is a ‘normal’ democratic society. The internment of Martin Corey coupled with the treatment meted out to another veteran Republican, Marian Price bears out the truism that when it comes to Ireland the default position of the British Government when dealing with Ireland is naked repression. In his judgement on the continued imprisonment of Martin Corey Justice Séamus Treacy ruled that the use of closed or secret evidence as the basis for interning Martin Corey was a breach of his human rights under Article 5 (4) of the European Convention on Human Rights. Despite this the then British Secretary of State Owen Paterson ordered that the case be heard by a second judge effectively subverting the original judgment. As Republican Sinn Féin’s POW Department puts it: “And so 41 years after the introduction of internment in the Six Counties it appears it is once more being employed as a means of silencing Irish Republicans. What has happened to Martin Corey constitutes not only an attack on Martin’s human and civil rights but are an attack on the human and civil rights of all people within the Six Counties. ”The continued imprisonment of Marian Price on trumped-up charges coupled with the vindictive imprisonment of Gerry McGeough tells us much about the true nature of British involvement in Ireland. So much for the much heralded human rights agenda of the Stormont regime what we have got instead is more of the same.” The statement concluded by calling on people “to join the campaign for the release of Martin Corey and help expose the true nature of British occupation”. Meanwhile in Maghaberry prison Irish Republican POWs continue to resist the inhuman brutalising regime which attempts to deny them of their right to be treated as political prisoners. However, like Republican prisoners of previous generations they have resisted all attempts to criminalise them or the cause for which they suffer the loss of their liberty. They are indeed worthy successors of all those who have gone before them. We salute them and pledge our unswerving support to them and their families. A day of action in support of the Republican POWs was held on October 27. It was the most significant coordinated display of international solidarity with Irish Republican prisoners in many years involving at least 16 protests in 12 countries on three continents. Protests or events highlighting the plight of the Republican POWs in Maghaberry as well as the internment without trial of Republicans such as Martin Corey, the illegal detention of Marian Price and the plight of Michael Campbell in Lithuania were held in Dublin, Lurgan, New York, Sydney, London, Rome, Manchester, Toronto, Paris, Glasgow, Hamburg, Colorado, Darmstadt, Dusseldorf, Magdeburg, Utrecht and Gothenburg. The worldwide events sent out a strong message that the political situation in Ireland is not normal and that British Rule is still being met with resistance. Of course such a successful day of action was accompanied by the usual State repression. In Lurgan the RUC/PSNI chose to use the protest to arrest Ard Chomhairle member Cáit Trainor for non-payment of a fine arising from a ‘Release Martin Corey’ protest march held in Lurgan in January 2011. Her arrest follows that of Lurgan Republican Martin Duffy on October 13 in relation to the same march. Martin Duffy was held for a week in Maghaberry prison, while Cáit Trainor was held in Hydebank prison also for a week. In Hamburg the German police broke up a protest at the Lithuanian Consulate and threatened those taking part with arrest. The spokesperson for the Republican Sinn Féin International Relations Bureau Dieter Blumenfeld, condemned the repressive actions by both the RUC/PSNI and the German police forces against Irish Republicans: “The arrest of Cáit Trainor at a protest in Lurgan and the breaking up of a peaceful picket in support of Michael Campbell in Germany shows that the reactionary and imperialist forces want to silence Irish Republicanism.” All who took part in the events on October 27 are to be commende. The spectacle of Martin McGuinness shaking hands with the Queen of England should not have come as a major surprise. One needs to simply examine the facts; he is a minister of the British Crown meeting the head of the State he serves. That is the reality of what occurred in Belfast’s Lyric Theatre on June 27. The road to reformism they embarked on in 1986 was clearly signposted along the way for those who wished to see where it led. Each step, such as the acceptance of the Unionist veto over national independence or the decommissioning of arms was carefully mapped out. The first step would involve an initial strenuous denial by the Provos of what was about to occur, the next step involved the inevitable announcement that the new departure was being considered or ‘debated’ by its members. The final step invariably involved presenting the latest sell-out as a fait accompli to its members in lieu of any meaningful consultation and to the general public as essential to ‘advancing the peace process’. The choreography has not changed, nor has the end result – further enmeshing in the machinery of the British State. Speaking on The History Show, on RTÉ Radio 1, on October 14, in a programme marking the 90th anniversary of the infamous Public Safety Bill used by the Free State to execute Republicans during the Counter-Revolution of 1922-23, Shane Mac Thomáis, a historian with the Glasnevin Trust made the observation: “What Michael Collins accepted in 1922, de Valera accepted in ’27 and Gerry Adams accepted in ’98”. Only the names change but never the result of the sell-out. The next step for the Provisionals will be to sit in the British Parliament in Westminster and just as before their protestations to the contrary ring increasingly hollow. The Sunday Business Post of July 1 reported that the Provos are now preparing to issue an apology to the British State for the deaths of its soldiers and police or anyone else killed or injured during the course of the war against British Rule. Such a development demeans the sacrifice of the IRA volunteers who sacrificed their lives not for a New Stormont but for a New Ireland. Such a move is simply a cynical attempt to fatally undermine the efforts of any future generation to end British rule in Ireland. The journalist Vincent Browne observed that the Provisionals have now adopted the unionist position, which views the Six-County State as the ultimate unit of decision-making rather than the Republican position, which upholds the right of the people of a 32-County Ireland to act as single unit of self-determination. We salute our members who protested at Belfast’s City Hall and at Belcoo RUC/PSNI barracks in Co Fermanagh against the visit of the Queen of England to the Six Counties. Also the people who placed a message of defiance on the Black Mountain in Belfast declaring, “Ériu is our Queen”. A protest entitled ‘Truth and Justice – not Jubilation’ attracted up to 1,000 people who marched from the Falls Road to Belfast’s City Hall. These actions tell us that there still remains a “respectable minority” prepared to defy the Anglicisation of our country. The normalisation process is all too evident in the 26 Counties also. On August 25 a ceremony was held in Ireland’s historic Glasnevin cemetery commemorating the infamous Black-and-Tans. The fact that this ‘ceremony’ was held in a cemetery, which contains some of the most illustrious of Ireland’s patriot dead merely compounds the insult. This event, ostensibly organised by two retired members of the 26-County police, should be recognised for what it is, the latest in an incremental attempt to rewrite Irish history in order to normalise and justify Britain’s occupation of Ireland past and present. Indeed the leading national paper the Irish Times devoted hundreds of column inches – including an editorial in pushing the publicity for this event. In February 2010 a similar ceremony was held in Granard, Co Longford. Half of the town was burned by the Black-and-Tans in November 1920. The strategy employed by those behind this policy begins by attempting to create an equivalence between the forces of the British Crown and the Republican Movement, from this the balance is titled to the point where the forces of British occupation and their actions are legitimised, while those of the Independence Movement are de-legitimised. This is demonstrated in the letter sent by the organisers to the Irish Times on August 22 described the purpose of the commemoration as being: “…to commemorate the over-500 other police officers who were murdered by the IRA during and after the War of Independence and in 1916”. Now we get to the heart of the matter. The use of the term “murder” immediately suggests that a state of war did not exist between Ireland and the British State and consequently the actions of the Irish Republican Army were criminal acts. This is to turn history on its head, which of course is the intention of those behind this campaign. There is no equivalence between the Independence Movement and the RIC. The RIC, described by the BBC history website as “the eyes and ears of Dublin Castle”, was an instrument of British repression in Ireland which acted in defiance of the Irish people’s historic right to national self-determination whilst the Independence Movement acted in accordance with, and in defence of, that right. There cannot be equality in value between the oppressor and the oppressed following a war of national liberation. The organisers of the Glasnevin event want to stigmatise the Irish side in 1916-22 as ‘murderers’. That is far beyond equivalence. This slavish commemoration, which the leading party in the 26-County Administration, Fine Gael, supported, is symptomatic of a state which has lost its way and is unsure of its identity. Does France commemorate the Vichy policemen or Norway its Quislings who collaborated with German occupation forces? All of this contrasts with the treatment meted out by the 26-County State to many veterans of the struggle for Irish freedom between 1916 and 1921. In 1985 a veteran of the 1916 Rising, Dorothy McDowell was allowed to die in abject poverty having been refused admission to Dr Steven’s Hospital, while today the same State prepares to elevate the British forces which people like Dorothy McDowell fought against in the cause of Irish freedom. The Glasnevin ‘ceremony’ on August 25 according to media reports attracted only small and unorganised protest. A repeat of such events will be met with much more attention and much better organisation. The march of the new economic and political imperialism of the troika, consisting of the EU/ECB and IMF, continues apace. Republican Sinn Féin played its part in the referendum campaign against the Austerity Treaty – as well as enduring the usual media blackout by RTÉ. As we pointed out during that campaign, the Austerity Treaty is the creation of the same political and financial elite who created the present economic collapse. During the so-called boom the profits of the wealthy were privatised to ensure they would not be shared with society, now during the bust they socialise their losses, forcing people across the EU to pay for them. Political events in France, Holland and Greece indicate that people have had enough of this kind of lop-sided economics. The voting patterns of the vote, which took place on May 31, tell us much about the polarisation of Irish society with the increasing divide between rich and poor. Those who have suffered most from the slash and burn economics of the political and financial elites recorded the highest percentage of No votes. Like millions of working people across Europe, working people in the 26 Counties have given out a strong signal of their determination to oppose the neo-liberal economic agenda that lies is at the heart of the entire EU project. EU power is based on the fear of the People not the will of the People. Of course we have seen it all before during the referenda on the Lisbon and Nice treaties. On both occasions people were forced to vote again for treaties they had already rejected. The power elites of the EU are intent on grabbing even more power. In all of this they have willing collaborators in the political establishment of the 26-County State. The system of finance capitalism driven by France and Germany created the economic collapse of the past four years, yet it is the working people of Ireland and Europe who are being asked to pay the price. It is time that the trade union leadership remembered that they owe their allegiance to the Irish working-class and not the hierarchy of the 26-County Labour Party. Social Justice Ireland highlights how the selective use of social and economic data by the Troika is leading to inaccurate analysis, which in turn is producing inappropriate policy recommendations for the 26 Counties. Amongst the points made by Social Justice Ireland are: Poverty in Ireland is rising despite Troika claims. The vulnerable have not been protected despite ‘Troika’ claims. - Not being able to afford a meal with meat, or a vegetarian equivalent, every second day. - Not being able to afford a weekly roast dinner. - Missing a meal over a two-week period, due to a lack of money. The coming years will see an increase in grass-roots opposition as we see with the various campaigns against the household charge, the septic tank charge, turf-cutting, health and education cuts. We applaud the leading role played by our own public representative Cllr Tomás Ó Curraoin, Contae na Gaillimhe and other Sinn Féin members in these campaigns. The need for unity between urban and rural, employed and unemployed, young and old, the public and private sector has never been greater. People must set about the essential task of building a mass movement that is capable of acting as a vehicle for radical political, social and economic change. The way forward is not to resurrect a failed political and economic model but to begin anew. A radical change in thinking is demanded creating real economic as well as political democracy. This means ensuring that the decisions which affect people and their communities, are made by them rather than unelected and unaccountable bureaucrats in Brussels or elsewhere. Our political and economic policies, ÉIRE NUA and SAOL NUA set out a blueprint for such a New Ireland. We believe that our programme for a Federal Ireland, ÉIRE NUA, along with our social and economic policy SAOL NUA, provides the basis for just such a radical transformation leading to a New Ireland. Taking control of the levers of political and economic power and decision-making are vital if we are to bring about the type of revolutionary transformation that is required. This includes taking ownership of our natural resources. We have only to look to South Africa to see what results from refusing to address economic as well as political inequality. It leaves us with the spectacle of an ANC government using apartheid-era laws to crush a miner’s strike. We extend our solidarity to the South African miners and salute the memory of their fallen comrades. They are part of the international fight against imperialism. The excellent booklet Liquid Assets, launched by Dublin Shell-to-Sea in September, sets out the extent of natural gas and oil off the Irish coast and proposes a number of options by which these can be exploited in the interests of the Irish people – in contrast with the present set-up where our resources are being given away. According to Shell-to-Sea: “International studies show that State ‘take’ in Ireland is among the lowest, roughly half the rate of countries with a similar economic approach. Yet when challenged the 26-County Administration peddle the big lie that the cost of exploration prohibits any State involvement. However Shell-to-Sea point out in Liquid Assets that “This is a false argument. In order to take a share in an oil or gas field discovered by a private company, the State would not need to have shared the risk involved in finding that field. The State can simply issue exploration licenses to private companies on the basis that when a discovery is made, the State will step in and take a percentage share in the ownership. These resources belong to Ireland.” International best practice should be followed in utilising our natural resources. Venezuela has had very large oil revenues for decades, but only since his government took control of the industry, away from foreign multinationals and local oligarchs, has the wealth it creates been distributed among the population. Unlike Ireland, and all the countries implementing “austerity”, poverty in Venezuela is declining, healthcare and education improving and the economy is growing. If Ireland is to benefit from an oil boom it needs to look to Chávez, not to Thatcher. As Irish Republicans we too believe this is the only way forward in keeping with the principle of the “The right of the people of Ireland to the ownership of Ireland.” We salute the on-going fight in defence of Ireland’s natural resources being waged by the Shell-to-Sea campaign. The announcement by 26-County Environment minister Phil Hogan of the decision to abolish town and borough councils in the 26 Counties marks yet a further power-grab by the Dublin based political elite. It marks a decisive shift in the balance of power between local communities and the Dublin administration. The 26-County State, already one of the most highly centralised states in Europe according to Dr Jane Suiter of Dublin City University, has increased further the imbalance of power between the Dublin administration and the people. This move serves to exacerbate the relentless power-grab of the EU political elite at a national level. The cumulative effect is to place ever-increasing power in the hands of unaccountable political elites in Dublin and Brussels while disenfranchising people on the ground. Republican Sinn Féin identified this imbalance in power relations over 40 years ago and forecast that it would only worsen. Through ÉIRE NUA we put forward a credible alternative to what was then and is clearly now a dysfunctional political system. The type of real decentralisation of decision making from national to provincial, to local level as advocated by ÉIRE NUA has never been as relevant or as necessary as it is today. ÉIRE NUA would empower people in a tangible way, ensuring that they, and not an accountable elite made the political, social and economic decisions that directly affected them and their communities. Buille mór don daonlathas agus don Ghaeltacht araon é deireadh a bheith curtha le toghcháin d’Údarás na Gaeltachta. In ÉIRE NUA ón tús thugamar tacaíocht don Ghaeltacht mar aonad féinrialaithe. Sna hOchtóidí, Nóchaidí agus chomh fada leis an gceann deireannach i 2005, ghlacamar páirt sna toghcháin don Údarás. Mar bharr ar an donas buille eile don Ghaeltacht ab ea críoch á chur le Scéim Labhairt na Gaeilge agus gan aon rud fiúntach nó spreagúil a chur ina áit. Molaimid iarrachtaí na Scoileanna Gaeltachta curaclam cuí agus cur chuige fíorthacúil a aimsiú do na cainteoirí óga dúchais. Freisin, is cúis mhór díomá dúinn a laghad dul chun cinn atá déanta le Straitéis 20 Bliain an Rialtais ó dheas don Ghaeilge. Earlier this year direct Údarás na Gaeltachta elections were abolished in what can only be described as a retrograde step. Since ÉIRE NUA first appeared we have always stood for maximum self-rule for the Irish-speaking areas. We have contested elections since Údarás elections began and condemn this shameful development. This anti-democratic move is also a huge blow against our Gaeltacht areas, which continue to find themselves under ever increasing English language pressure. As further evidence of the marginalization of the Gaeltacht speakers, we view with extreme dismay the complete removal of the Gaeltacht Irish-speaking Families Scheme and its replacement with a woolly and non-inspirational set of leaflets for parents. The Scheme, while it had its faults, was universally accepted, provided motivation and was a very accurate barometer of the strength of the language. In recent months the efforts being made by the Gaeltacht Schools to finally provide an appropriate curriculum and supports for young native speakers are very worthwhile of recognition. Meanwhile outside the Gaeltacht the silence of the 26-County Departments of the Gaeltacht and Education on the 20-year 26-County State Strategy on the language, almost three years old, is deafening. Beginning next year with the centenaries of the foundation of the Irish Volunteers, the Irish Citizen Army and the 1913 Lockout, the coming decade will be one in which we will mark some of the key events in our revolutionary history. Other anniversaries including the landing of the arms off the Asgard in 1914 and Pearse’s oration at the grave of O’Donovan Rossa act as milestones on the road to the centenary of the Rising. The years after 2016 will bring the centenaries of the historic 1918 General Election – the last occasion in which the Irish people acted as a unit in a single vote on the question of Ireland’s right to national independence. The Tan War, the British Government of Ireland Act of 1920 which led to the partition of Ireland, the Treaty of Surrender and the subsequent Civil War or Counter-Revolution. All will be reminders of where we have come from and how far we have still to travel. In April we launched the build-up to 2016 and the centenary of the Rising with a very successful seminar entitled Who Fears to Speak of Easter Week? Among the speakers was the historian Dr Ruan O’Donnell of Limerick University. However the coming decade is not merely a matter of historical memory, commemoration or inquiry. No, it is much more than that. This decade marks an escalation in what is a battle for hearts and minds. The build-up to the Centenary of the 1916 Rising is rapidly developing into a battle over not only how we view our past but also the vision we have for our future. The speech by Stormont First Minster Peter Robinson marking the centenary of the signing of “Ulster’s Solemn League and Covenant” in 1912 at the Head Quarters of the 26-County Department of Foreign Affairs at Iveagh House on March 29 is the first step in a campaign to dilute and sanitise the Centenary of the 1916 Rising. The political establishments in Stormont, Leinster House and Westminster have signalled their intention to suppress any meaningful commemoration of the 1916 Rising by burying it in a celebration of the imperialist carnage of the First World War. The 1916 Proclamation and the so-called “Solemn League and Covenant” symbolise the fundamental difference in the vision for Ireland held by Irish Republicans as opposed to the forces of imperialism. The ‘Solemn League and Covenant” was written in the narrow, sectarian and patriarchal language of empire, while the 1916 Proclamation addresses itself to “Irishmen and Irishwomen” in the inclusive language of democracy, progress and human freedom. Irish Republicans unapologetically declare that 1916 will remain unfinished business while “the right of the people of Ireland to the ownership of Ireland” continues to be denied by either the old imperialism of British occupation or the new imperialism of the EU and IMF. We should view the coming decade as an opportunity to infuse a new generation with the same idealism, principle and endeavour that moved a nation between 1913 and 1923. The October edition of SAOIRSE addressed the ongoing attack on the integrity of Irish Republicanism from the myriad groups and gangs using that honoured name as a cover for their nefarious activities. It is something which bears repeating here: “A new threat has emerged in recent years and in many ways one which is potentially the most serious of all that Irish Republicanism has faced throughout its long history. “The emergence of groupings styling themselves as ‘Republican’ but who in reality are merely using that noble title to mask their real purpose of extortion and racketeering. In some cases such groupings masquerade as anti-drugs activists, posing as ‘champions of the community’. These gangs are an insidious threat to the very survival of the Republican ideal. “These pseudo-Republican groups seek to control their communities through fear. Posing as revolutionaries hides the grim reality that the only war they wage is not one of national liberation but instead a war on the youth of their own communities. The forcing of a father to present his son for a punishment shooting as happened in Derry is medieval and far removed from any ideal of progressive Republicanism. “The drugs’ gangs who peddle their wares in communities throughout Ireland and across all classes are enemies of the Irish people. The community and political activists who oppose them deserve our full and active support. Irish Republicans are rightly proud of the part they played in groups such as Concerned Parents Against Drugs in the 1980s, and today it is vital that Irish Republicans continue to stand by their communities both urban and rural in opposing these dealers of death and social destruction. “However the pseudo-Republican groupings that take money from the drug dealers are no less parasitical than the drug dealers themselves. In many ways they are worse in that they leech from the communities they purport to defend – in effect they are drug dealers by proxy with the added insult of sullying the noble name of Republicanism in doing so. “The activities of these pseudo-Republican gangs have the potential to eat away like a cancer at the very heart of Irish Republicanism, leaving in their wake an empty husk with neither relevance nor credibility. SAOIRSE also addressed itself to the threats posed directly to Republican Sinn Féin: “Over the past two years Republican Sinn Féin has been a direct target of such activity. A Limerick-led grouping has attempted to steal our identity and good name in order to cloak their criminal activities. “This particular gang meet the criteria of the classic black operations or ‘black ops’ engaged in by State forces whereby a shadow grouping is set up which is a perversion of everything that the legitimate revolutionary movement represents. The purpose of these bogus groupings is to sow confusion, lower morale and discredit the genuine revolutionary movement. Irish Republicanism has always appealed to the highest and noblest instincts of young people. Today we should be no different and the bar we set for membership should be as high as that set by those who went before us. Facing into another year it is right that we should be conscious of the challenges, and threats that face us but importantly we must also be aware of the opportunities that are there for us. We must work to increase our profile on the ground and in this regard we must step up our preparations for the 2014 local elections in the 26 Counties. There is much work to be done and many battles to be fought on the political, the social and the economic front. As we approach the centenary of the 1916 Rising, Republican Sinn Féin’s place is in the vanguard of the struggle for a 32-County Federal Democratic Socialist Republic, a Republic worthy of the ideals set out in the Proclamation of Easter Week. We are the true heirs to a proud and noble revolutionary tradition and we neither apologise nor bend to anyone in making that assertion. Indeed we should draw confidence for the tasks ahead by that very fact. 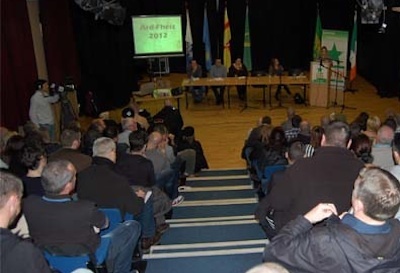 éirígí’s 2012 Ard-Fheis was held in An Chultúrlann in west Belfast on November 18. Below is the text of the 2012 Ard-Fheis Statement, which was read to the assembled crowd by Dublin City Councillor Louise Minihan. This Ard-Fheis reasserts the right of the people of Ireland to freedom, to collectively decide their own political, economic, social and cultural futures, free from the interference of foreign governments. We reject the right of the British state to claim jurisdiction over the Six Counties as we equally reject the right of the European Union and the International Monetary Fund to govern the Twenty-Six Counties. Assembled here in Culturlánn McAdam Ó Fiaich, this Ard-Fheis confirms éirígí’s commitment to the Irish language. We recognise that a nation without its own language will succumb much more easily to imperialism and capitalism – something that our enemies have long understood. We recognise the precarious position of Ireland’s native tongue at this time and commit our party to becoming more active within the Irish language movement. The cultural re-conquest of Ireland must be fought in parallel to its political, economic and social re-conquest. This Ard-Fheis reiterates éirígí’s call for the immediate release of all Irish republican political prisoners wherever they are being held. We unreservedly condemn the ongoing brutalisation of republican prisoners in Maghaberry Jail and, in advance of their release, we call for those prisoners to be given the full political status that they rightly deserve without further delay. This Ard-Fheis recognises that both partitionist states are now implementing internment without trial through a number of means, including the revocation of parole licences, spurious membership charges and unduly long periods of remand without the existence of evidence. In the absence of a general release of all republican prisoners, we call for the immediate release of all of those who are currently being held without trial or in some cases even the prospect of trial. This Ard-Fheis notes with deep concern the continuing erosion of basic civil liberties and legal rights in both the Six and Twenty-Six County states. We call for the repeal of all oppressive ‘special’ legislation that has been created for the purpose of suppressing Irish republicanism. This Ard-Fheis totally condemns the recent decision by the Six County coroner to halt inquests into the murders of twenty-one victims of British state violence on the grounds of “British national security”. This unprecedented action is designed to bring these and other such inquests under the remit of the proposed ‘Justice and Security Bill’ which will result in secret hearings, with secret evidence being given behind closed doors, from which victims of state violence and their legal representatives will be excluded. In the month that two further potential oil finds off the west coast of Ireland have been announced this Ard-Fheis call for the immediate nationalisation of all Irish hydrocarbon resources, including the Corrib Gas Field and Barryroe Oil Field. At a time of ever-increasing energy costs the giveaway of Ireland’s oil and gas reserves represents an act of simultaneous economic stupidity and national treachery. We reassert the inalienable right of the people of Ireland to benefit from the natural resources of their own country. This Ard-Fheis stands with those members of the community in Rossport and surrounding areas who remain steadfast in their opposition to Shell and their partner companies. We re-affirm our support and solidarity to the community of Iorras. This Ard-Fheis recognises the importance of the mass boycott of the Dublin government’s home tax and commends the hundreds of thousands of people who have joined this collective act of civil disobedience. Such a widespread act of popular civil disobedience has not been witnessed in Ireland since the Land League campaign at the end of the 19th Century or the anti-Conscription campaign of almost one hundred years ago. The Campaign Against Household and Water Taxes has succeeded in developing the first mass movement of recent times that has the potential to effectively challenge the agenda of Ireland’s right-wing forces. We commit our party to building popular mass opposition to unjust home, water and other taxes. We condemn the Dublin government for their slavish adherence to the diktats of the Troika and their willingness to put the interests of the ruling elite ahead of the interests of the rest of the population. We note with disdain the blatant hypocrisy of proposing constitutional amendments to protect children whilst simultaneously cutting funding to children’s education, healthcare and welfare. This Ard-Fheis notes that fourteen years after the signing of the Good Friday Agreement, the political parties that make up the permanent Stormont coalition still hide behind the so-called peace process to disguise their collective failure to deliver any progressive social, economic or political change. For too many people in the Six Counties, that new dawn that the Good Friday Agreement promised has been proven, like the political parties who supported it, to be completely false and without substance. Emigration, unemployment, poverty and deprivation remain all too commonplace within all working class communities across the occupied Six Counties. This Ard-Fheis understands the Six-County State to be fundamentally irreformable and we reject the notion that the interests of the population of the Six Counties are best served by partition and subservience to Britain. This Ard-Fheis asserts that the austerity programmes of the administrations in Leinster House, Stormont and Westminster have nothing to do with ‘economic recovery’ and the creation of a sustainable, just economy and everything to do with the rolling back of rights and conditions that were fought for and expensively won. As we enter 2013, the hundredth anniversary year of the 1913 Lockout, this Ard-Fheis takes inspiration from those workers who stood up against the foreign and domestic capitalist class; who stood firm in the face of threats, brutalisation, imprisonment and death; who asserted the right of Irish workers to organise and take collective industrial action; who through the establishment of the Irish Citizen Army exercised the right of workers to defend themselves from attack. This Ard-Fheis accepts and fully endorses James Connolly’s Marxist-based analysis of the development of Irish society and believes that analysis remains as valid and as applicable today as it was 100 years ago; this Ard-Fheis views capitalism to be a form of theft which seeks to deprive the working man and woman of that which is rightfully theirs: the intrinsic value of their own labour. Like Connolly and his comrades, we also fight for an Irish Socialist Republic, understanding that it alone can guarantee the interests of the Irish working class.